Note: I have updated this article a couple of times since it was first published, so be sure not to miss the additions. I want to begin by saying how much I like and appreciate John Piper and how difficult it is, then, for me to write this post. Although I do not know John well, I was greatly helped by his fatherly advice when I was involved in the debate over Openness Theology (or Free-will Theism) in the Baptist General Conference some years ago. He offered perspective, wisdom, and even some needed confrontation of me on a few points. I was going through a very difficult time in my life and ministry while at the same time caught up in a denominational debate I would rather not have been a part of, and John was a helpful guide for a young and troubled pastor. I don't know if he would even remember me now, but I will always be grateful for the time he took to offer some much needed guidance and concern. Clearly John believes that Wilson himself "gets the Gospel right." But I have some real doubts about this, especially, as I have already noted, given Wilson's adherence to Federal Vision theology. I first found out about this aberrant theology when I attended a 2002 (or 3?) pastors' conference at Auburn Avenue Presbyterian Church in Monroe, Louisiana. I was invited to go – and in fact driven there – by a man who attended our church at the time, but who had previously been a member at Auburn Avenue. Doug Wilson was one of the primary speakers at that conference, and that is where I first discovered who he is. Frankly, I was shocked at some of what I heard coming from a PCA church (or at least what was a PCA church at the time, because they have since left that denomination, no doubt due in part to the PCA's rejection of Federal Vision theology as unacceptable). For example, I heard men espousing baptismal regeneration and asserting that those who have been properly baptized are saved thereby and possess all the saving benefits of Christ. They also said that such saved persons can apostatize and reject the Christian faith and no longer possess the saving benefits of Christ. But then, out of the other sides of their mouths, they claimed to hold to the Westminster Confession of Faith in its teaching on the perseverance of the saints. When I had lunch with Doug Wilson and asked him how he could say such things and still claim to hold to the Westminster Confession's position on the perseverance of the saints, he told me that there is a difference between those who are elect and those we must regard as saved from our point of view. When I asked follow-up questions, such as whether or not regarding a person as saved meant also regarding that person as elect, I just got a lot of what I considered to be double-speak in response. Needless to say, I never went to another pastors' conference at Auburn, and I left with a decidedly negative view of Wilson's theology, however likable I found him to be on a personal level. But I am disturbed by the fact that John doesn't seem to see this double-speak for what it is. As the following video demonstrates, he appears instead to be enamored by Wilson and therefore misses what are obvious and unbiblical inconsistencies in Wilson's position. Notice how John speaks of Wilson as being "very complicated" for saying completely illogical and truth-distorting things. How, after all, can one speak logically – let alone Biblically – about an "unregenerate elect" person, or an "unregenerate regenerate" person as Piper agrees that Wilson does? This is not saying the same thing as one would say who agrees that there may be professing Christians who turn out to be unsaved in the end, as John assumes. It is speaking in a very confusing way about fundamentally important matters, but John prefers to call it "very complicated" instead, while he reminds us how "bright" Wilson is. And then he goes on to talk about how Wilson "gets a bad wrap from a lotta PCA guys who aren't careful in the way they think." This just reminded me of how sick I have become of the Federal Vision guys constantly complaining about how "misunderstood" they have been and blaming everyone else for misrepresenting them when the real problem is their constant redefinition of historical theological terms and categories while at the same time claiming to believe in the historical meaning of those same terms. I don't think they are being misunderstood at all. I think they are being called on the fact that they are deliberately playing all kinds of language games. And even if they are being misunderstood, who's fault is that!? Isn't it their own fault? I mean, how can the rest of us be blamed for thinking that the laws of logic should still apply to theological discussion? Anyway, I am surprised at and disappointed in Piper's not seeing the problem and calling Wilson on these kinds of things. After having met Wilson and spoken with him for a while – as I indicated above – I can testify as to how charismatic and winsome he is. After speaking with him, you kind of want to agree with him just because you like him. And he is just as bright as John says he is, which is why it is so hard not to hold him accountable for his strange and inconsistent assertions about key doctrines. Could it be that Piper has been won over by the strong and engaging personality of Wilson? It sort of looks that way to me, even if he has "only met him once." 1. Pitting Scripture and Confession against each other. 2. Regarding the enterprise of systematic theology as inherently rationalistic. 3. A mono-covenantalism that sees one covenant, originating in the intra-Trinitarian fellowship, into which man is invited, thus flattening the concept of covenant and denying the distinction between the covenant of works and the covenant of grace. 4. Election as primarily corporate and eclipsed by covenant. 5. Seeing covenant as only conditional. 6. A denial of the covenant of works and of the fact that Adam was in a relationship with God that was legal as well as filial. 7. A denial of a covenant of grace distinct from the covenant of works. 8. A denial that the law given in Eden is the same as that more fully published at Mt. Sinai and that it requires perfect obedience. 9. Viewing righteousness as relational, not moral. 10. A failure to make clear the difference between our faith and Christ's. 11. A denial of the imputation of the active obedience of Christ in our justification. 12. Defining justification exclusively as the forgiveness of sins. 13. The reduction of justification to Gentile inclusion. 14. Including works (by use of "faithfulness," "obedience," etc.) in the very definition of faith. 15. Failing to affirm an infallible perseverance and the indefectibility of grace. 17. Denying the validity of the concept of the invisible church. 20. Ecclesiology that eclipses and swallows up soteriology. No wonder R. Scott Clark, Professor of Church History and Historical Theology at Westminster Seminary California, has issued A Gentle Rebuke to Brother John for the remarks he made in the above video. Clark does see the Gospel as being corrupted by Wilson and other Federal Vision advocates, as a number of the above listed issues demonstrate. Of course, Wilson may not hold to every aberrant position as listed or stated here, but he does hold to enough of them to warrant genuine concern that the Gospel is being at best distorted and confused by him. Given such issues, I am glad that John at least says that he is "worried" and "concerned" about the "trajectory" of the views Wilson holds. I just wish this concern had led to his steering clear of Wilson rather than essentially endorsing him by involving him in the Desiring God Conference. Last night I listened to all three hours of the "grilling" John referred to of Doug Wilson by the CREC presbytery. After listening to the exchanges, I can understand a little better why John doesn't see Wilson as being quite as dangerous in his adherence to Federal Vision theology as so many in Presbyterian circles do. Wilson is quite a bit more measured and careful in his statements to the presbytery than he has been at other times and in other venues. It is a bit easier to see how John can say that Wilson is wrong, "but wrong in the way that you would expect a Presbyterian to be wrong." To be sure, even in the exchange with his presbytery, Wilson said some things that I find quite disturbing, but he did avoid some of the more extreme kinds of things I have personally heard him say before or that I have seen written in documents such as the 2007 A Joint federal Vision Statement. So, the problem here may be that John simply has limited knowledge of Wilson's actions and assertions, and rather than listening closely to what those who have had to deal head on with the problems of Federal Vision theology in their own churches have to say, John just asserts that Wilson "gets a bad wrap from a lotta PCA guys who aren't careful in the way they think." I am disturbed by this the more I think about it, because John simply dismisses the collective judgment of many of those who may know Wilson and his crowd best. Again, as I noted previously in this post, I know that Wilson and others in the Federal Vision camp frequently like to claim that they are being misunderstood, and John may believe this claim with respect to Wilson. But I still assert that they aren't being so misunderstood at all; they are just being challenged for – at the very least – speaking of important doctrines in such a way as to distort their meaning. But, again, even if they are at times being misunderstood, I think it is almost entirely their own fault for speaking in consistently equivocal ways. So, again, after listening to the whole exchange between Wilson and the CREC presbytery as John suggested, I am still no more certain as to what Wilson really believes about some things, because I don't think he has been consistent in what he has said on various occasions. Could it be that Wilson has backed off of some things or corrected his views at some points? Perhaps, but I would like to see clear evidence of that before being convinced, and I still think it is a very bad idea for John and the Desiring God ministry to invite him to their conference. But this leads me to another matter, which is why John feels it necessary to include such a controversial figure as Doug Wilson in the first place. I mean, aren't there a number of much less controversial figures who could have spoken at the conference on the topic of "The Sacred Script in the Theater of God: Calvin, the Bible, and the Western World”? In fact, aren't there some even better choices regardless of whether or not Wilson is a controversial figure? What about a guy like R.C. Sproul? Or Michael Horton? Or Robert Peterson? If he wants a Presbyterian to talk on this subject, surely there are many others to whom he could have looked. 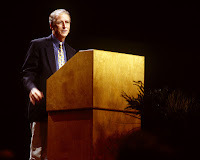 I thought it only fair that I include yet another video by John Piper in which he seeks to explain himself further with regard to his inclusion of Doug Wilson in the Desiring God Conference back in September. I do not doubt John's sincerity, of course, but I am still a bit disturbed when he describes Wilson as "really consistent and really clear" and then also admits that Wilson uses language "that causes a lot of trouble for people" because it describes people as Christians who are not Christians, who are elect but going to hell, etc. This just doesn't seem either consistent or clear to me, nor to many others who have judged Federal Vision theology a danger to the faith, in part precisely because of such lack of clarity on crucial doctrines. Anyway, I thought the many people who have been reading this post would appreciate hearing John explain himself further. I also want to reiterate that I have great respect for John even when I disagree with him, as I do on this issue. John Piper is my favorite "famous" preacher to listen to, but I feel that, even though his rebuttle to Tom Wright's heretical view of justification was very good, that he gave Wright way too much credit. And I feel that he's doing it again with Doug Wilson. 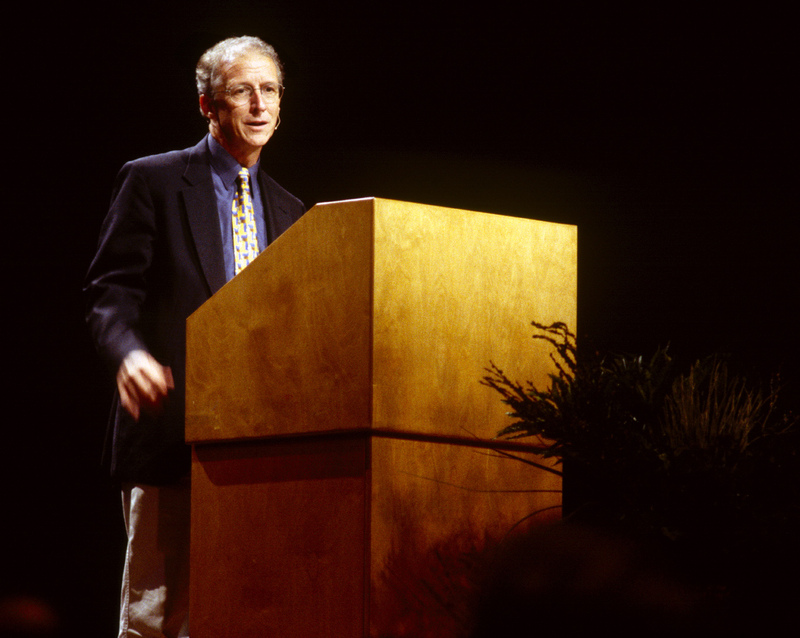 John Piper can preach the gospel of justification by grace through faith and double imputation better than anyone I've ever heard, but I think he muddies the water a bit with sanctification, going almost antinomian without actually getting all the way there. Clark also includes unbelievers (infants and children) in the New Covenant, as do all confessing Presbyterians, and that unbelieving adults that operate within the church are also partakers of the covenant and recieve covenant benefits and blessings. We Baptists, of course, believe that one becomes partaker and heir of the covenant as they are united to Christ by faith, who is the fulfillment of, promise of, and true heir to all the Biblical covenants. Scott Clark gets my undies in a twist every time he asserts that the phrase "Reformed Baptist" is a misnomer, a mistake he loves repeating. It's high time a Reformed Baptist with clout and credentials (hint *Pastor Throop* hint) took him to task on his repeated error. Thanks for you input, brother! You have raised a a few good points here. I also agree that Clark's view of the covenant community is wrong, which is one reason that I have rejected the Presbyterian view of covenant theology in favor of a Reformed Baptist view. I also agree that Clark's attack on our use of the term "Reformed" in conjunction with the term "Baptist" is annoying and wrong. In fact, as I thought it about more after reading your comments here, I removed from the post my suggestion that John Piper could have gotten Clark to speak at his conference instead of Wilson. And I decided to take up your challenge to respond to what he said about Reformed Baptists in his rebuke of John. I will try to write a post in response to Clark on this point in the coming week. However, I don't think I agree with your assumption that I am a Reformed Baptist "with clout and credentials." I think that description would be better applied to guys like Sam Waldron, Bob Gonzales, or James White than to me. But thanks for the compliment, which is how I think you intended it. And thanks again for your gentle and friendly challenge! I look forward to your post justifying Baptist use of the term "Reformed". I've been following you for a few years and know you can do a good job. I'd like to take this opportunity to thank you for all the E-Sword modules and other resources you've given away over the years- thanks! I look forward to your article and can't wait to link to it on my blog. I think Piper's probably trying to extend the courtesy we might imagine Paul extended to James if he ever read, "A person is justified by works and not by faith alone." That is not a sentence Paul would have ever written, but it is canonized. What Piper's done is listened to Wilson explain himself and what he means when he speaks of the "unregenerate regenerate", etc. Wilson uses different words to describe similar things. Given that James can make such a statement without contradicting Paul, I think it's perfectly possible for Wilson to say Christians can lose their salvation without contradicting the Westminster Confession (and even while remaining faithful to many parts of scripture which seem to speak in that way). The reason it's possible is because by "Christian" he means something very different from what a Baptist might mean by "Christian", just as James meant something very different when he said "faith" from what Paul meant when he said it. Of course the difference there is Wilson and Piper do disagree on many points of theology, but when it comes to the most weighty things, I think Piper is right in listening to Wilson explain why he uses the language he does. Thanks again for your encouragement. I'll give it a shot! The really big difference between your Paul/James analogy and the situation with Piper/Wilson is that Paul and James were both inspired by the Holy Spirit in their respective discussions of faith and their speaking of justification in different senses. But in my view, and that of many others, Wilson is unscriptural and unnecessarily confusing in his teaching on such issues as baptism, regeneration, election, perseverance, etc. As for the importance of listening to Wilson explain himself, I believe I have indicated quite clearly in my post (and the update to it) that I have done this myself, and perhaps even more so than Piper. Of course, John may have listened to Wilson more than I am aware of, but he only indicates having listened to the three hour CREC presbytery session. I would also point out that in my update to the post, I indicated that I could understand a little better why John has said what he has about Wilson given the CREC presbytery exchange. But, again, the problem is that Wilson hasn't always been consistent in the way he has spoken about the issues involved, and he definitely hasn't always been so careful. And I just don't think it is wise for John to lend credence to the ministry of such a guy. I appreciate your thoughtfulness and your pastors heart regarding this issue. Once I read from everyone (except the Federal Vision [FV]) what the FV was, it was easy for me to say, that is indeed heresy (that is the denial of justification by faith alone, baptismal regeneration, ect...) but once I started looking into what Doug Wilson believed I found the opposite. I don't it helpful to lump all the FV proponents together because there is alot they don't agree on,...and it is not a united front as several of the Presbyters have made it out to be. I too listened to Doug's examination and understand where Piper stands (although I still think it unwise to invite Doug Wilson to a national conference like this, especially with all the controversy surrounding him). Anyways, I have been talking about this with some other Reformed Baptist brothers here: http://tinyurl.com/lg4rch and thought you may be interested. I keep hearing and reading all these accusations against Doug Wilson, but all I find it the opposite when I go directly to him. Thanks for your comments. Unfortunately the url you gave doesn't work (at least not for me). Could you post a more complete one? 1) I am basing my own perspective primarily on my own hearing of Wilson and discussion with him. I am not simply following what others have said about him. 2) I agree that we should be careful not to simply lump Wilson in with every other Federal vision advocate. However, even though Wilson wants to distance himself from some of them at times, he is less than concerned about it at other times. For example, see the Joint Federal Vision Statement that he signed and which is linked in the update to my post. In addition, Wilson was at the now (in)famous Auburn Avenue Pastors' conference with some of these men and did not distance himself from any of their assertions there. In fact, he seemed to go along with them and was one of the most outspoken of them (in spite of Schlissel's being there). Anyway, I remain unconvinced that Wilson is as careful as John thinks he is, given that he has not always been so consistent in what he says. I am glad we agree that it was a bad idea for John to invite Wilson to speak at the Desiring God Conference. Thanks for the corrected link, Jason. Thanks for this informative article. It is about time that the Federal Vision has gotten the attention it deserves as an heresy from us Reformed Baptists. The Presbyterians have been paying attention for years now. It is imperative that we protect our flocks from this deadly error. Although I appreciate some of Piper's works myself,see his the article by John Robbins at http://www.trinityfoundation.org/horror_show.php?id=35 for statements showing a denigration of sola fide. I am even aware of a sermon he has given on Andrew Fuller in which he infers Scott Clark is a Sandemanian see http://pbaptist.wordpress.com/2009/03/07/andrew-fuller%e2%80%99s-broadsides-against-sandemanianism-hyper-calvinism-and-global-unbelief-desiring-god-2007-conference-for-pastors-%e2%80%93-john-piper/ for this. With Dan Fuller being his hero and his Charismatic Theology I guess I am not too surprised by this situation.